Presented by Dr. Jonathan Epstein and prepared by Dr. Robby Jones. A 12 year old female was noted to have a bladder mass. Histological Description: The transurethral resections consists of multiple polypoid fragments lined by unremarkable urothelium. Immediately beneath the urothelium is a condensed layer of small spindle cells with relatively uniform small ovoid but hyperchromatic nuclei with occasional mitotic figures. Deeper within the polypoid fragments are similar cells that are more loosely arranged in a myxoid stroma. 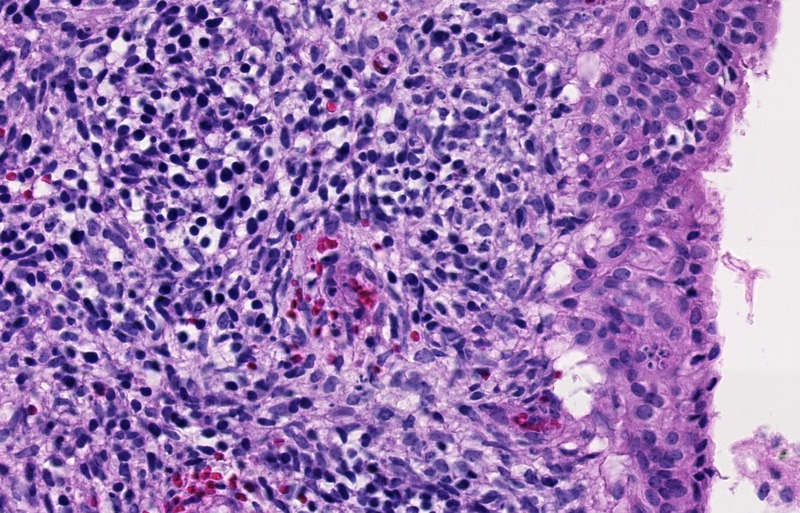 Discussion: In a child or adolescent, one should always have rhabdomyosarcoma at the top of the differential diagnosis with a spindle cell tumor. Although much more common in children, embryonal rhabdomyosarcomas can also be seen in the bladder in adults. 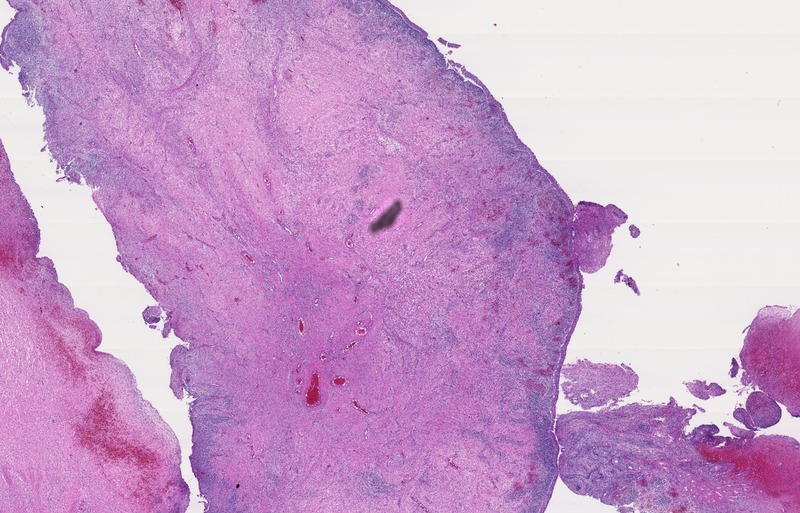 The condensed layers of spindle cells underneath the mucosa is termed a cambium layer and is classic for botryoides rhabdomyosarcoma which has the appearance at cystoscopy of a bunch of grade. In some cases one can more readily see on the H&E cells with abundant eccentric pink cytoplasm and even occasionally cells with cross striations typical of skeletal muscle differentiation. In this case, these cells are lacking and it would be reasonable to confirm the diagnosis with immunohistochemistry for myogenin. 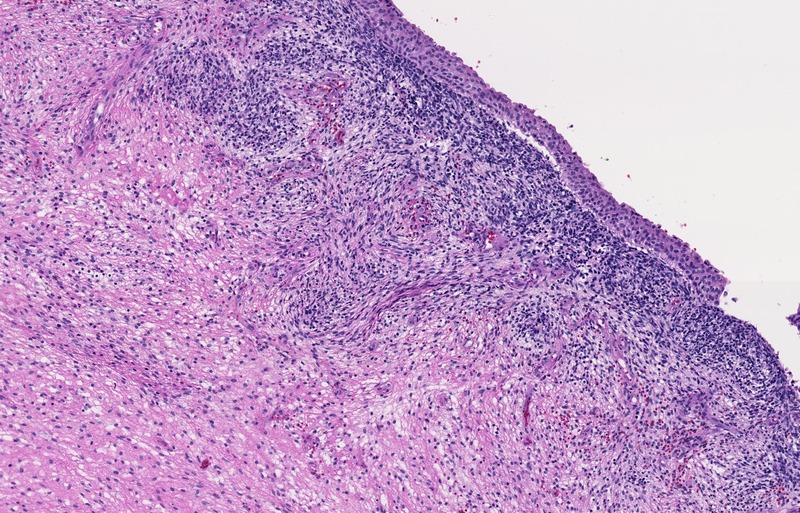 This variant of rhabdomyosarcoma has a relatively favorable prognosis in part due to the tumor growing towards the lumen as opposed to down into the muscularis propria with a resulting lower pathological stage. Polypoid cystitis would not have spindle cells and would have associated inflammation. Fibroepithelial polyps can occur in children but have hypocellular dense fibrosis and not hypercellular and myxoid stroma.